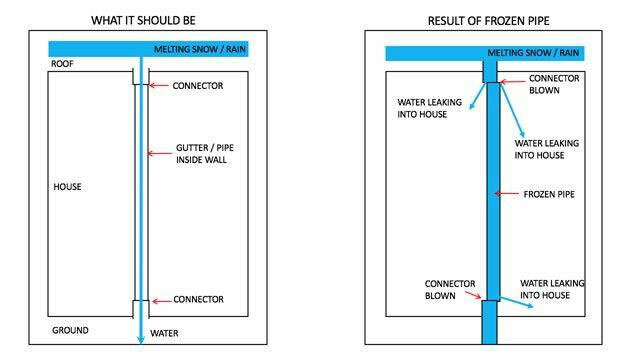 First of all, you might be asking yourself, “what is an ice dam?” Seems like a valid question to address before we get into ice dam prevention. In a nutshell, an ice dam is the build-up of ice along the eaves of your roof. Any sloped roof on a heated building is susceptible to the formation of ice dams in the winter as heat from the building melts snow on the lowest layer of snow pack. As snow along the eaves freezes, roof drainage is disrupted and an ice dam begins to form. The problem with ice dams is that they can cause damage to the roof and other structures of the building. Icicles are also likely to form along the perimeter of a building, and ultimately roofing leaks are a common consequence of ice dams. So, how do you prevent ice dams? The ideology behind preventing ice dams is fairly simple – you want to keep your roof and its eaves at a consistent temperature. Most often, this is accomplished by improving ventilation throughout the roof, installing adequate insulation, and sealing air leaks to prevent warm internal air from escaping and melting snow. There are a number of hot spots (no pun intended!) that are the main contributors to ice dam formation – let’s take a closer look. The eaves and ridges of your roof need to be ventilated properly in order to circulate cold air under the roof. Typically, this can be achieved by combining a ridge vent with soffit vents that allow cool air movement. The vents should have openings of equal size and a good rule of thumb is to allow 1 square foot of opening per 300 square feet of attic. You also want to ensure unobstructed airflow through soffit vents by installing baffles at the eaves. Attic hatches and other roofing fixates must be properly sealed to prevent indoor heat from escaping. Weather-stripped caps can be installed along attic hatches to keep heat indoors. These covers typically feature foil-covered foam panels that provide good insulation. Likewise, ducts from the kitchen, bathroom, and laundry room need to be vented properly. You should connect these ducts to the outdoors via your roof or exterior walls but avoid soffits. The more insulation you install, the less likely heat will escape through the attic floor. By adding insulation, you prevent heat loss which ultimately melts snow along the surface of your roof. Building codes provide adequate recommendations for how much insulation you’ll need. As you can see, the name of the game is preventing snow from melting. Flashing around chimneys, sealing and insulating ducts, and caulking around any spots where air can escape through your roof will help to prevent ice dam formation.